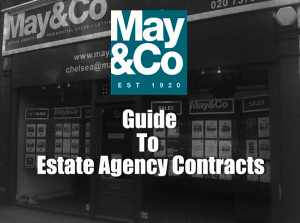 Guide to Estate Agency Contracts | May & CoMay & Co.
Don’t become the victim of unscrupulous estate agents and end up having to pay thousands of pounds of commission to and estate agent who did not even find you a property. 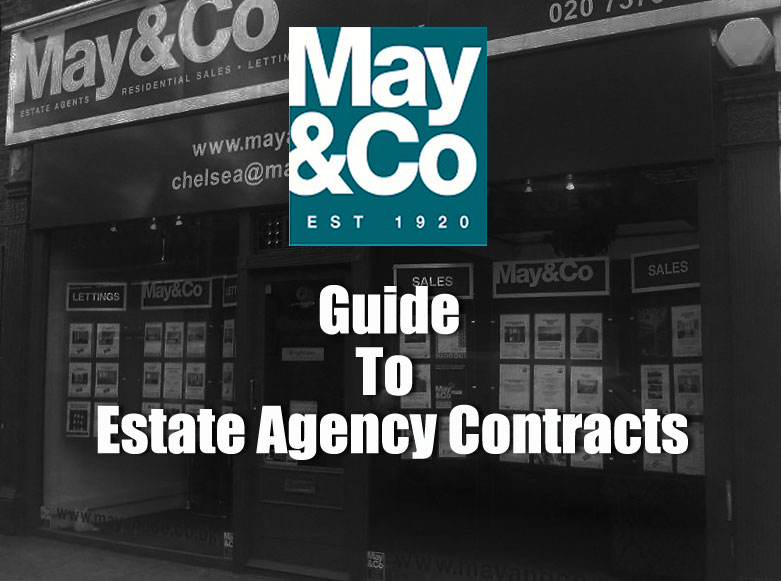 Read our guide to estate agency contracts and find out about what terms of the contract to look for and the different types of estate agency contracts. Before you sign the contract make sure that you are completely clear about the type of selling arrangement you are entering into. There are different types of contracts and it is important that you choose a contract that suits your needs. Of course, once the sole agency contract has ended, all your options are open again. Youcould extend the contract or alternatively, you could re-engage your estate agent under a ‘Multiple Agency’ or ‘Joint Sole Agency’ contract. Whatever you do, be careful not to confuse ‘Sole agency’ with ‘Sole Selling’. In the case of a ‘Sole Selling’ the contract is also be with one agent, but here the estate agency commission is due, even if you found a buyer yourself. On the other hand ‘Joint Sole Agency’ agreements could make a lot of sense in some cases. For example, if you chose estate agents that specialise in different markets and would not compete against each other. A national agency specialising in exclusive properties could for instance be teamed/paired up with a general local agent. This would mean that your net would be cast wider. ‘Joint Sole Agency’ contracts have to be distinguished from ‘Multiple Agency contracts’.A ‘Multiple Agency Contract’ means that you appoint more than one agent with no fixed contract period. In fact, if you so wish, you can add or remove as many agents as you want. Only the agent that actually finds the buyer will receive any commission. Because of the initial outlay in marketing a property, some estate agents will not enter into a ‘Multiple Agency’ contract. According to the Primelocation “The strategy of engaging multiple agents is often only for those who are under serious pressure to sell their property fast, as commission fees tend to be higher than with a ‘sole’ agent.” Also, some people believe that it “smacks of desperation and often causes buyers to become suspicious of (or dismiss) your property.” As the commission is not split, problems could also arise among agencies, as to who found the buyer. So if you opt for this type of contract, it might be wise to keep a note of which estate agent arranged which viewing. However, there are also some advantages. This type of contract will, for example, give you a lot more flexibility. You can choose the number of estate agency you want to use and for how long you want to use them for. To make sure that you have covered every niche, the Buy Association suggests “Instructing at least three agents, including a smaller, independent one and a representative of one of the larger chains”, to “maximise your opportunities.” It really depends what your needs are. Although “Multi Agency Contracts” cost more” there is no denying the fact that “your property will get more exposure” which will increase “the prospect of a quick sale.” Of course, there is always room for manoeuvre. You could for example, as Moneyfacts suggests that “start out with sole agency” and then move “to a multi agency agreement at the end of the tie in period.” Alternatively, you could opt for a ‘Joint Sole Agency’ agreement instead of a Multi Agency one. The ball is in your court. Compare like with like. “Get to the Bottom Line – Every agent will have a slightly different marketing package and fee structure. Ensure that all costs associated with selling are fully explained and that a total figure is given and confirmed in writing. That way you will know exactly what you will have to pay at the end of the process. They you can compare each quote, like for like, to decide which is the best option for you! Property expert Henry Pryor believes that ‘Tempting though it is to grind agents on price, now might be a time to remunerate them to find a buyer,’ says Henry Pryor, of www.housingexpert.net, himself a former agent. ‘Being relatively generous will help keep your house at the top of the heap.’ Primelocation agrees with this. They believe that getting “the fee down may end up being a false economy. Remember, your estate agent works on a commission and you want them to be motivated to sell your property fast. By haggling too low, you may be taking away much of the incentive the estate agent needs to focus on your sale. Henry Pryor has noticed that “Plenty of agents will also cut their fees by finding buyers without advertising your property.” Buyers, who don’t have their property exposed on the open market, are, of course, running the risk of selling for less than it is worth. Would you be happy for your property not to be exposed on the open market? If an estate agency is offering very low fees, find out what service and package you will be getting in return. We hope our articles will help you maximise the return on your property and wish you much success with the sale of it!! Next month we are looking at what home improvement are best to increase the value of your property.